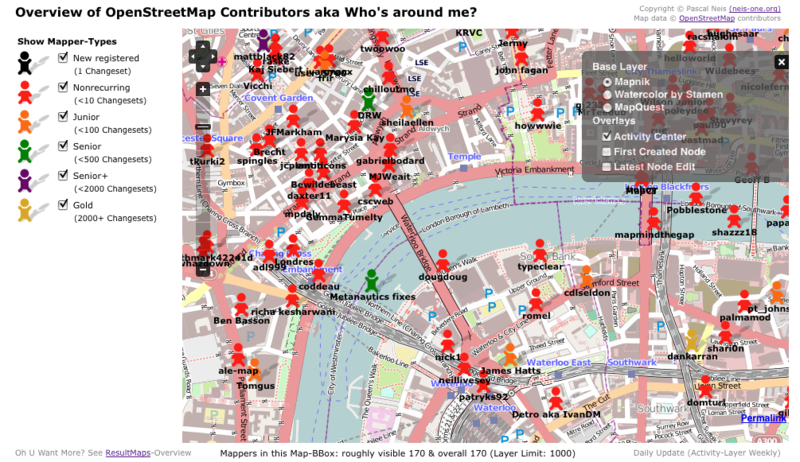 The OpenStreetMap Contributors Map aka Who’s around me? : Neis One! The above image shows the created map for the center of London. As you can see, there are several Mapper-Types to choose from on the left side. Each mapper type is distinguished by the number of changesets that were created (shown in parentheses). However, most of the time you will see many orange or red figures on the map , which means that the OSM project has a lot of members who only made a few changes. This “issue” or “phenomenon” has also been mentioned in the publication. Below the map you can find additional information which shows the current number of mappers in your map’s bbox. Sometimes the number is a little bit larger than the real number of contributors in your area. This depends on the method that Openlayers uses to load the mappers from my server onto the map. For the next update, I maybe plan to add the dates of the latest contribution of a member. This way you can get current information about the number of (active) contributors for your area. The data will be updated on a daily and weekly base. It is also important to mention that each layer has a limit of 1.000 contributors to show on the map. Thus, if you zoom out, you will always see contributors, but sometimes the real number is much higher than the number of mapper icons you see on the map. Last but not least some stats: Today (Jan 6th, 2012) the OpenStreetMap project has reached 1 000 000 registered members. Around 300 000 (30%) of all contributors created at least one changeset and about 200 000 (20%) volunteers created at least one Node. Of the 300 000 contributors who created at least one changeset, around 240 000 created less than 10 changesets, 45 000 (4.5%) between 10 and 100 changesets and 17 000 more than 100 changesets. I think this amount of 17 000 mappers or 1.7% of all registered members is obviously the amount of active OSM members. This is also comparable with the official OSM “highly active users” stats from here. Overview of OpenStreetMap Contributors aka Who’s around me? AWESOME Pascal! I really wanted this back when I started, trying to find active people near me. Very, very nice, Pascal. This could also be useful to meet and help nearby mappers. nice tool. but.. why take all changesets into account when computing activity center? why not just last 6 months for instance. the user could’ve moved for instance. First off: This is superb! Makes it a _heck_ of a lot easier to understand who’s mapping — and who _could_ be mapping more in an area + reaching mappers in an area / building a community (hopefully). Per the activity center: I’d _love_ to see some options here, even just two. e.g. activity center (1) since the Big Bang (or last 1-2 years), and (2) of last 6-9 months. BTW. Do you accept Paypal, Flattr or some other form of modest monetary thank yous? .. If so, perhaps you could put a not of that into the resultmaps page? in most cases the popup can not be closed anymore. is there any way to zoom/centre to a specific user (by name) ? Excellent tool Pascal, nice work yet again from you, keep it up! This is really awesome. Now when we plan mapping parties in a new area, we can find new people to invite. If you ever get to Seattle, I want to buy you a beer. With mapping parties in mind, is it possible to get the usernames displayed as an export, JSON or something? If the code is on github or something I would be happy to work up a pull request to the feature. Hi Pascal, for some reason I don’t appear on that map. I have my location set to 53.5978141550103 / 10.0450403412896 and already have 327 edits as my OSM profile tells me. Something wrong with your script? Cool. I like the new “last 6 months” layer of the oooc map too. My little golden baby icon has moved to some city in Syria at the moment! Looks great! But quite misleading to rank users by changesets. Some gold users (2000+ changesets) added/modified around 5000 thousand objects, while some seniors (500- changesets) has over 20 thousands of objects. An option to rank by number of object addition or edit would be appreciated. Is the code published online anywhere like github? nope, sorry, the code is not available. But if you like, I can provide you with some kind of API or data-dump or … ? Greakt work – very useful, Pascal! First of all, I want to thank you for some of the most useful OSM tools I’ve found, I use them all the time. I do a lot of armchair mapping around the world, so my location on the ‘Who’s Around Me’ page is somewhat random. However, none of the overlays shows my actual location, which is London. I was wondering if it’s possible to add an overlay that shows the home location as set in a user’s profile. This would be useful for the social mapping aspect of OSM, meetups etc.